The majority of macroscopic organisms ,algal, fungal, plants and animals lived in this Eon.It consists of three major divisions, the Paleozoic era, Mesozoic era, and the Cenozoic era.The word ' zoic' comes from the word Zoology/zoo meaning animals and 'paleo' means primitive, 'Meso' means middle while 'Ceno' means recent. Development of vertebrates along with invertebrates. 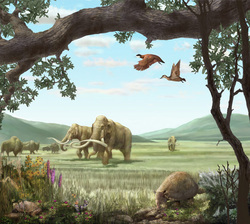 In this section however, The Cenozoic Era will be discussed in detail. The cenozoic era stars after the mesozoic era and continues till the present, from 65 million years till today. It is the most recent of all the three major subdivisions of the animal history and is divided into two main periods-tertiary and quarternary. 1) Tertiary period : Lasts from 65 to 1.5 mya.this period has been divided into two substages, Paleogene(65-24 mya) and Neogene(24 -1.8 mya). 2) Quarternary period : This is called the age of man as the first Homo sapiens evolved in this period. Besides, the Mammoths, Sabre toothed tiger, Marsupial lion, ground sloths, birds were evolved.This period can be divided into two Epochs: Pleistocene (1.8-0.11 mya ,last ice age) and Holocene, (11000 years to recent.The development of Human civilization took place during this Epoch. The Cenozoic Era begun after the Mesozoci Era ; from 65 million years till present!